This year’s off-road project has been a disaster, and I’ve now got only eight days to essentially repair an entire suspension system, braking system, steering system, electrical system, and also to get the engine running properly. It’s good news, then, that—of all years—this is the one year that failure is not an option. Needless to say, I may need some help along the way. Please. In years past, I’ve reached out to readers in an effort to build a network of folks along my route willing to help me get a vaguely car-shaped chunk of iron oxide across America. And though I’ve only had to leverage my network of readers once, something tells me that this time I won’t be so lucky. The reality is that I’m going to break down on this trip at some point. And to be honest, my Jeep probably will, too. When those happen simultaneously, having a network of Jalops to perhaps lend a wrench or a shoulder to cry on would be immensely appreciated. Especially since this year, there will be no support vehicle. Just me, Project POStal, a crap-ton of tools, and the open road. Gulp. Stakes are higher this year than ever, which is unfortunate, because the Moab project of 2019 is the crappiest one yet. This was never the plan, to be clear. Prior to buying the Jeep sight unseen, I had asked a friend to inspect it, and he unfortunately missed the giant two-foot hole in the frame (To be fair, I was buying a car without looking at it—this is all on me). As for why I’m so far behind—that’s just a combination of cold weather slowing me down, parts suppliers sending me the wrong parts, work, and the primary factor: bad time management on my part. In any case, I have to get something safely running and driving in the next eight days. I have no choice, because one of my brothers is flying to the U.S from Papua New Guinea to join me on this trip, and another brother is flying into Moab. In any case, what this means is that, if I’m unable to get this Postal Jeep safely running and driving, or in the highly likely event that I break down in the first 750 miles, I’ll have one brother who spent thousands of dollars on a flight stuck in Kansas City, and another stuck in Moab. In any case, now to the main point of this article: I may need some help. If you live anywhere along the route shown above and you’re willing to help, and also, you’re either not a serial killer or you’re a thoroughly reformed one, first off: thank you. Second, please email me at david.tracy@jalopnik.com. 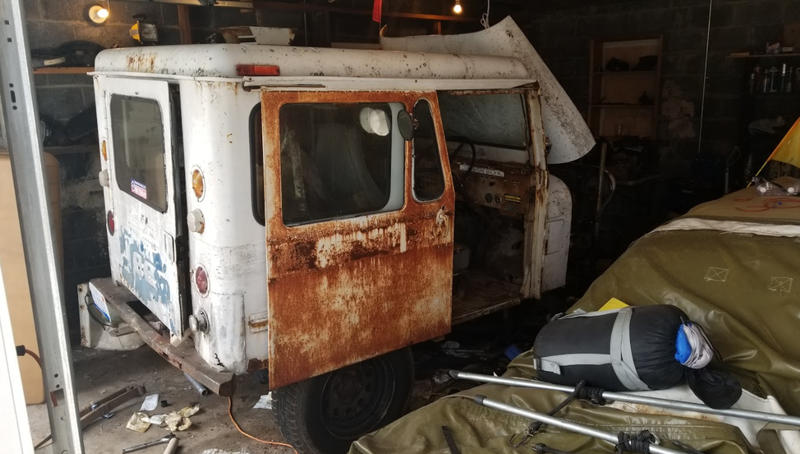 Also, in case you were wondering whether I’ve made much progress since my last update a week ago, the answer is “not really,” since I’ve been driving and writing about Jeep trucks. But I have scored a few victories on the ignition system and brake system fronts—victories that I will enumerate in an update on Jalopnik tomorrow. I plan to crank up my post frequency now that Wrenching Frenzy 2019 has begun. Over the next eight days, I will wrench so hard that my joints will start ratcheting and my appendages will assume the shape of an open-end wrench. This mutation will be thoroughly documented on my Instagram page. Whether it will yield a drivable vehicle by April 10, only the wrenching gods know, but even if it does, a network of willing wrenchers along the route could be the only way this Jeep gets to Utah.